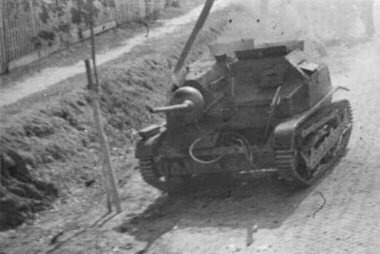 From among some 570 Polish tankettes, only a handful of TKS armed with 20 mm cannons were able to fight against enemy armour during Polish Campaign in September 1939. Unfortunately, their rearmament started too late and no more than two dozen of these vehicles entered service by the outbreak of World War II. With advantages, like small silhouette and agility, it appeared a successful tank destroyer and one of most valuable Polish armoured vehicles. After last update (2018), the page contains most up-to-date information on assignment and combat use of these vehicles, lacking in printed sources so far. Development of Polish tankettes - in Part I; description, specifications and modelling - in Part II. Note: W marks external links to Wikipedia articles. 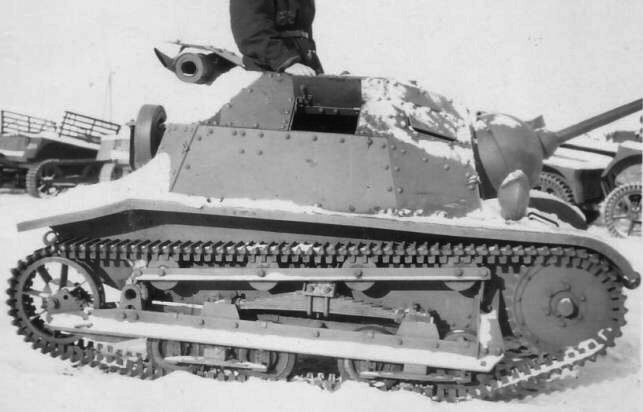 Just as a production of Polish tankette TK (TK-3) was starting, it was realized, that the tankette armed with a standard 7.92 mm wz.25 Hotchkiss machine gun can not efficiently fight against any armoured vehicles, and is able to fight manpower and soft vehicles only. 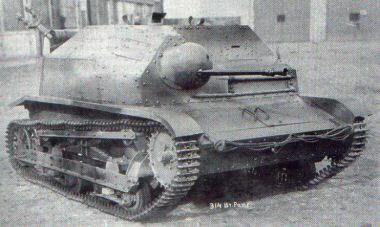 The British had offered a light self-propelled gun with Vickers 47mm gun as one of Carden-Loyd Mk.VI tankette variants, so the Poles planned to build support tankettes with stronger armament as well. A development of Polish support tankettes went in two ways eventually. There was created a light self-propelled gun TKD with 47mm wz.25 Pocisk infantry gun, but only four experimental vehicles were built. On the other hand, there were trials of replacing a machine gun in a standard tankette with a big caliber machine gun or an autocannon. Initially, it was planned to arm TK tankettes with 13.2 mm wz.30 Hotchkiss machine gun, but its armour penetration appeared too low, while bullets' dispersion was found too high, so it was abandoned in a favour of 20 mm cannon. 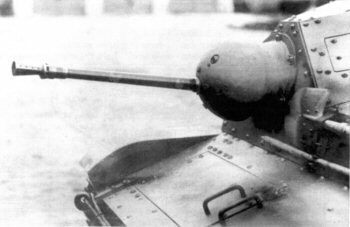 Solothurn cannon mounted in TKS (it can be distinguished from the FK-A by a shorter barrel, mounted lower in a smaller mantlet). TKS tested with 37 mm wz.18 Puteaux gun in 1936 (hauled by the 7TP tank prototype). 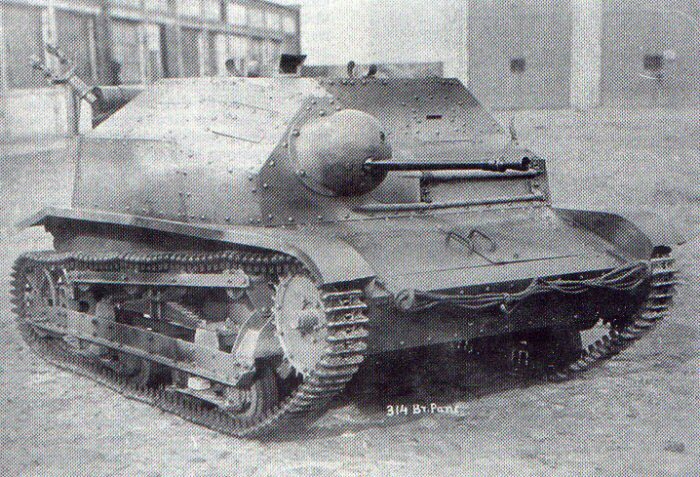 The first cannon tested in a tankette was a Swiss semi-automatic 20 mm Solothurn S18-100, bought in 1935. It was fitted in one TKS tankette, using a provisional mount at first. 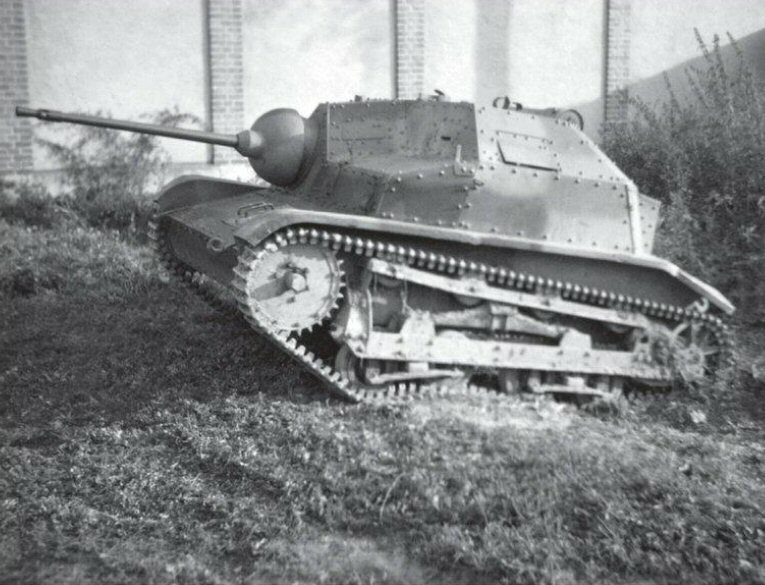 The tankette was tested on a proving ground in February 1936, then it was fitted with an improved Cardan mount with a hemispherical cover. The evaluation proved, that arming tankettes with cannons was a good idea, but Solothurn S18-100 did not meet all demands, and fired only single shots. Autocannons tested by the Army (on portable mounts), like older model of Oerlikon J LAS (bought in 1931) and Solothurn S5-100 (bought in 1935), were not satisfactory either. Therefore, military authorities decided to search for a new weapon, fit also for aviation, anti-aircraft and anti-tank defence, and design a domestic autocannon at the same time. 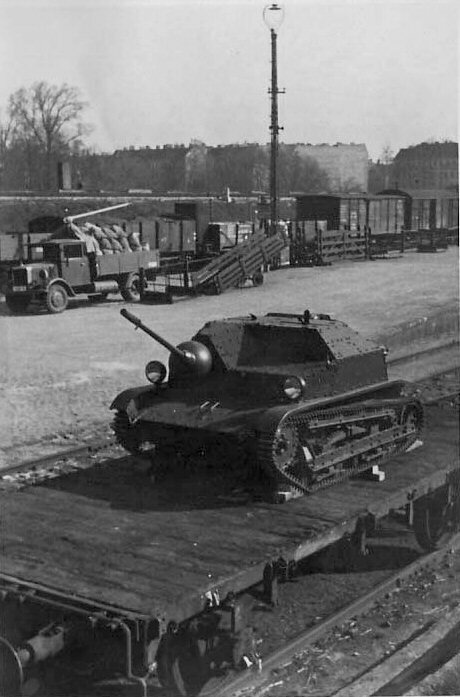 Oerlikon FFS and Madsen 20 mm autocannons were acquired in 1937 for tests, while several Polish designers started works upon such weapons as well. It should be noted, that about 1936 there was also tested a TKS with a short-barrel French 37mm wz.18 Puteaux (SA-18) semi-automatic gun. The gun was mounted in a standard universal ball mounting in a place of a machine gun (it was used that way also in part of Polish armoured cars). It was a WWI-vintage weapon, best fit to fight machine gun nests, with poor armour penetration capability. There exists a photo from tests, but other details are not known. 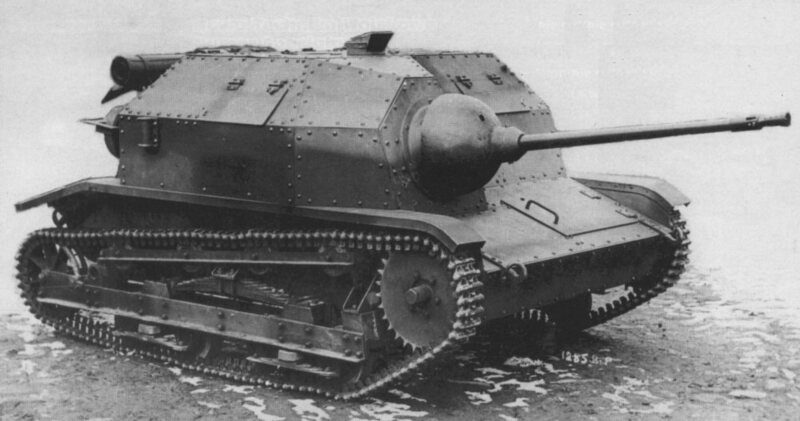 It seems, that this might have been an interesting support vehicle for ordinary tankettes, easy to produce, with basic anti-tank capabilities, but the idea was abandoned for unknown reasons (in practice, the wz.18 gun mounted in armoured cars wz.29 appeared quite efficient weapon against light tanks). 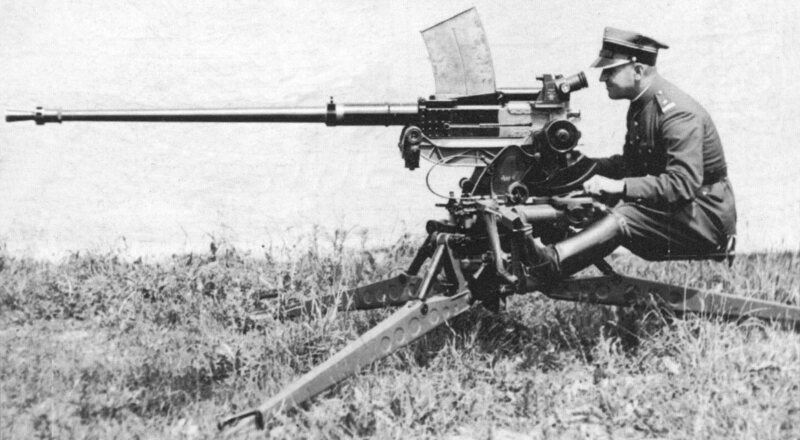 A prototype of model A gun on Oerlikon tripod mount . 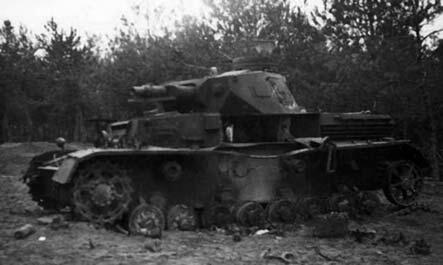 An interesting photo of the German-captured TKS with cannon mantlet removed. A roof comparison of the TKS with 7.92 mm MG and 20 mm cannon (irregular shapes on hatches are leather strap handles). [drawings: J. Jackiewicz / P. Sembrat]. A TKS of the 10th Cavalry Brigade interned in Hungary. Note a protective canvas on cannon's mantlet, and a high muffler, indicating early series TKS. The soldiers are Hungarian and Polish. In 1937, Bolesław Jurek of Fabryka Karabinów (FK, Rifle Factory) in Warsaw constructed a recoil-operated 20 mm automatic cannon model A, also known in short as the FK-A. The model A offered slightly better armour penetration, than tested Oerlikon and Madsen cannons, and was evaluated as a better weapon for armoured weapons' needs. As a result, it was accepted under a designation: 20 mm wz. 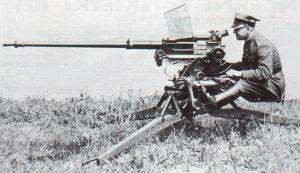 38 (Pattern 1938) heaviest machine gun (Polish abbreviation: nkm). It was considered an interim weapon for armoured forces and infantry, until newer designs would be ready (first of all, gas-operated model C gun). In summer 1938 the first batch of 100 cannons was ordered. 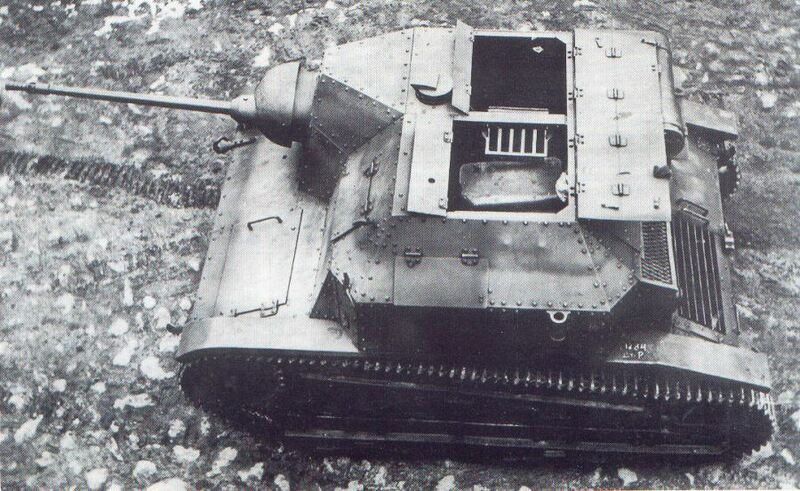 At the same time, in mid-1938 a prototype was tested on 4TP tank. Two pre-production cannons were delivered to the armoured weapons in late 1938. Strangely, it was first tested in January-February 1939 in modified TK tankette, which would need more changes to fit the weapon, than the TKS. 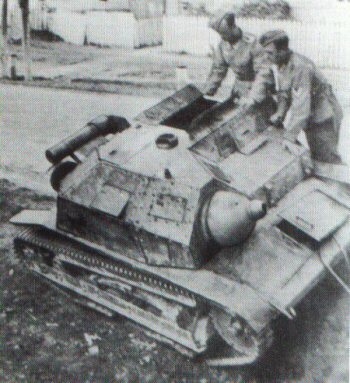 For tankette use, a Cardan mount was designed by Jerzy Napiórkowski, with a big hemispherical armoured mantlet (the barrel was fixed in the mantlet centrally in a vertical axis, offset to the left from a central point). Rearming of the TKS demanded relatively small changes in armour – a new front plate with a bigger weapon opening, new plates above the weapon, and enlarged rear part of gunner's hatch, with forward part of the hatch replaced by a fixed plate. The Gundlach reversible observation periscopeW in new lengthened fixed upper plate had to be displaced to the left because of a bigger weapon (some tankettes were early series TKS, that had no periscope before). The gunner's hatch was therefore a bit smaller and opening rearwards only. There also changed positions of three thimbles for signal flags. Small changes had to be made to interior equipment, to accommodate racks for 15 five-round magazines; the sixteenth magazine could be loaded in the weapon. A notable detail was a removal of redundant external anti-aircraft MG pivot mast on right hull side. Such modification of the TKS was worked out in February-March 1939. 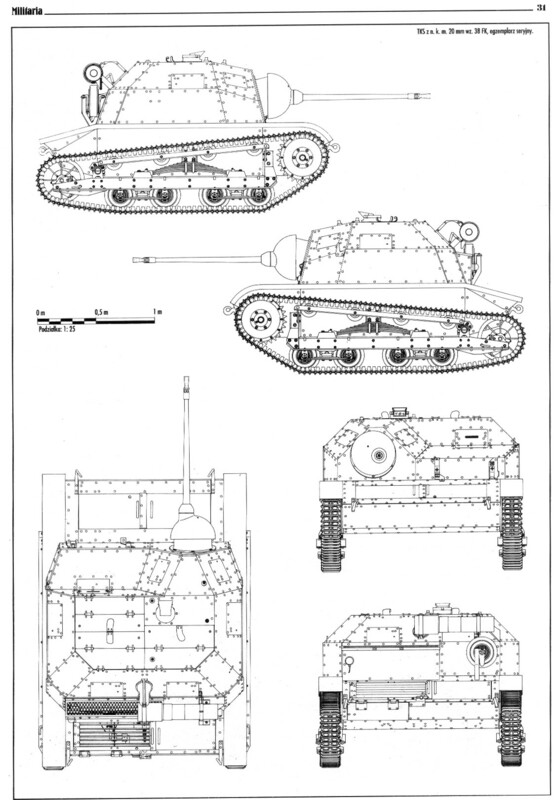 Since the tankettes had screwed armour, the modification could be proceeded in unit workshops, with supplied parts, according to a manual from 22 June 1939. However, in order to save time, it was finally decided, that first batches should be rearmed at state-owned PZInż F1 car factory in Ursus near Warsaw, instead of Experimental Workshops of Armoured Weapons' Technical Research Bureau (first 10 tankettes) and battalion workshops. A rearming of the TK-3 demanded more changes, described further. The cannon with a scope sight costed some 30,000 zloty, the modification of the TKS costed some 4,000 zloty, and of the TK-3 some 5,000 zloty. Specifications of tankettes were similar to basic models, apart from slightly increased weight and length with a gun. 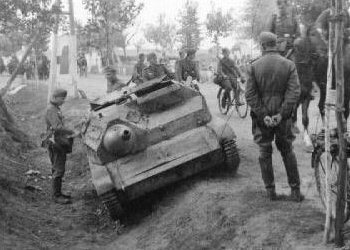 The military authorities hesitated on how many tankettes should be rearmed, and plans changed several times from 1937, ranging from 1/3 of TK-3 and TKS tankettes to all of them. There were also doubts, if rearming of worn out TK-3s was purposeful at all. On 26 April 1939 the Armoured Weapons HQ expressed plans to rearm 100 TKS tankettes with the first series cannons, then rest of TKS (270), then TK-3 tankettes (about 570 in total), provided, that funding would allow. In late May 1939, the second batch of 100 guns was ordered, and it was finally decided to rearm 150 tankettes – 80 TKS and 70 TK-3, what was approximately 1/3 of combat-worthy vehicles. At that time, in early 1939, a production of guns, barrels, ammunition, sights, mantlets and armoured plates was only starting, in different factories. As for cannon production, an offer of Zieleniewski firm was chosen, which is viewed as an error by some, because it was placed in a newly-built factory in Sanok, while the state-owned Fabryka Karabinów had free production capabilities and could have started production earlier. Probably it wouldn't change the situation much, as there were also other parts needed to complete. The first ten cannons of the 100 ordered were delivered in May 1939, the next ten in July. New armour plates were made by Baildon Steelworks in Katowice and Southern Works in Stalowa Wola starting from mid-July. Mantlets of first series were ordered from two manufacturers for comparison: Lilpop, Rau and Loewenstein in Warsaw (cast) and PZInż (forged). In May 1939 it was ordered to rearm first 10 tankettes TKS (selected only on 7 July), in June – another 14. First ten vehicles were completed in late July, probably all fourteen of the second batch – in August. On 14 August 1939 the order was extended for remaining 56 TKS and 70 TK-3. It was expected at that moment, that next eight TKS should be ready by 30 August 1939, another eight TKS and sixteen TK-3 by 15 September 1939, and the rest gradually by January 1940. Despite these plans, there might have been delays, and in addition there are no documents found, whether specific TKS were ordered to be delivered for rearmament from Armoured Battalions, apart from initial 24. Some 55 cannons were produced by the war outbreak, but a number of complete modernization kits was lower (according to some documents, there were manufactured parts to rearm 40 tankettes). As a result, probably only 24 TKS tankettes were rearmed before the war (there is no direct confirmation, but there should have been no obstacles to complete all in accordance with a schedule). There is no information, if any further vehicles were completed at the PZInż before or during first days of the war, which was theoretically possible, provided, that the tankettes had been assigned. Polish military authorities eventually decided to rearm a number of older TK-3 tankettes as well, in order to provide TK-equipped units with cannons without mixing equipment types, what complicated maintenance. 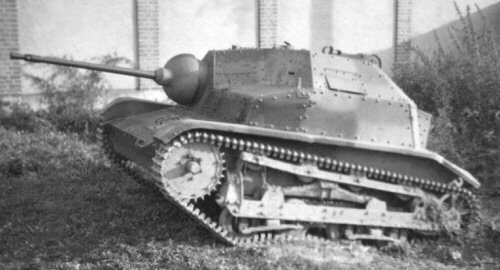 As it was mentioned, already in the end of 1938, one TK-3 tankette was experimentally fitted with the FK-A cannon, with an addition of a front superstructure on the right side, before the commander-gunner. Its silhouette became similar to the TKS, but it had a longer superstructure, without a niche before the driver's head. The commander's post was also fitted with Gundlach reversible periscopeW, what improved his situation awareness (it demanded replacing a front part of a wide common roof hatch with two smaller individual hatches, while rear part remained common). In January 1939 this conversion was approved, and after a decision to rearm TK tankettes, an appropriate manual was worked out on 14 August 1939. In late August the 1st, 5th and 8th Armoured Battalions were ordered to send four TK-3 each to Ursus works. 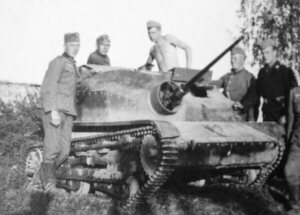 It was first planned to rearm 16 tankettes TK-3 by 15 September 1939, but there is no evidence so far, that any were rearmed (some publications suggest, that three have been completed). They were supposed to equip Armoured Units nos. 71, 81, 51, 11, but first two (and probably even three) received cannon-armed TKS eventually. In spite of numerous photographs, mostly taken by German soldiers, and including more than half of cannon-armed TKS, there have been no cannon-armed TK revealed. The fate of the prototype is not known (the cannon might have been removed from it after testing the conversion). There is no mention in publications, if it was constructed of armoured steel or mild steel. The latter possibility seems very likely to us, as for the superstructure at least, but maybe for a whole hull (there was a batch of 15 early mild-steel TK made, used for training and experiments, and it is not known so far, which vehicle was used for conversion). 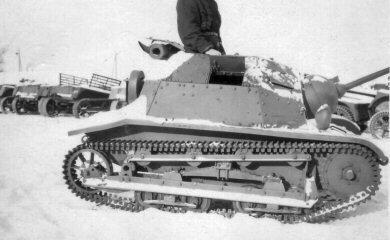 The prototype of the TK-3 with 20mm FK-A gun (it is often erroneously taken for the TKS, especially, that such factory photos of TKS do not exist). The modified tankette retained only one front gear inspection hatch. It was first planned to include five tankettes with cannons into a tankette squadron or company (of 13 tanks), but eventually in June 1939 it was reduced to four (two per a platoon, without a company's commander tank, which less often took part in direct combat). The commanders of peculiar armies wanted cannon-armed tankettes, and an assignment plan of the first series was changing in last weeks before the war, while a conversion process was on the way. There are lacks in documents, and that is why the details of their actual assignment and quantity are not sure. It should be kept in mind, that before the war, Polish armoured weapons were organized in armoured battalions, which were peacetime units only and were to mobilize other units in case of war. 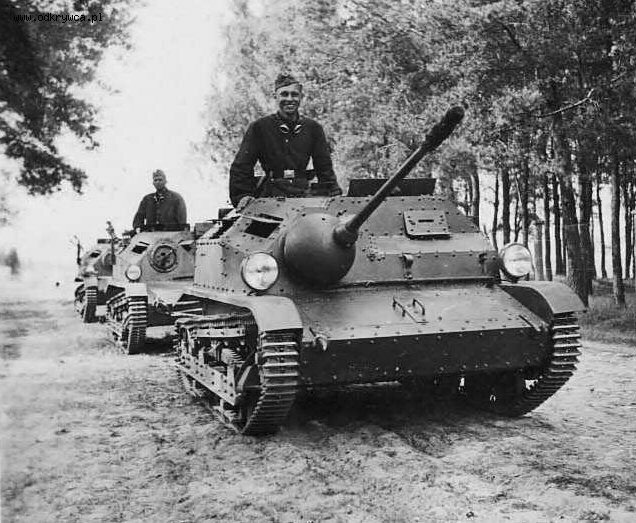 First of all, cannon-armed tankettes were to be given to mobilized battalion-size Armoured Units (aka Armoured Detachments – Dywizjon pancerny in Polish) of the cavalry. The biggest number of tankettes with cannons – eight, were assigned to the motorized 10th Cavalry Brigade (10.BK) of Colonel Stanisław MaczekW: four tankettes in a squadron of the Brigade's reconnaissance unit (TKF-equipped) and four in the 101st Reconnaissance Tank Company (TKS-equipped). There are some doubts expressed, if the Brigade had all eight tankettes, or only four, but there were such orders, and there are no obstacles known[note 1]. There were plans to create additional tankette platoons in motorized regiments, increasing a total number of cannon-armed tankettes in both motorized brigades to 12, but it was not realized before the war. 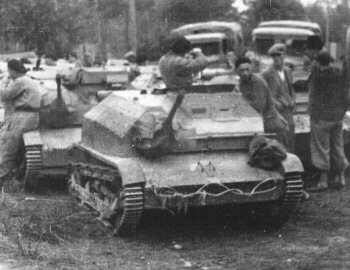 Next eight vehicles were to be given to the second motorized brigade: Warsaw Armoured-Motorized Brigade (WBPM), but since it was under organization at that time, on 23 August 1939 – shortly before the war, it was ordered to pass its cannon-armed TKS to the 1st and the 8th Armoured Battalions. It was planned, that the WBPM would receive new ones by 5 September, but most probably it received only four cannon-armed tankettes eventually. Probably two were given to its 11th Reconnaissance Tank Company and two to its reconnaissance unit. Four TKS tankettes with cannons (ex-WBPM ones) were assigned to tankette squadrons of the 71st Armoured Unit of Wielkopolska Cavalry Brigade and the 81st Armoured Unit of Pomorska (Pomeranian) Cavalry Brigade, mobilized by the 1st and the 8th Armoured Battalions respectively. Both units were TK-3-equipped, so a rule of not mixing equipment was breached. Some accounts however claimed, that the 81st Unit had only three tankettes with cannons[note 2]. There is no firm information on last four tankettes of the first series and possible further ones. According to an initial plan from 21 June 1939, after motorized bigades, they were to be given, in order, to Armoured Units nos: 71, 51, 81, 11, 91, 62, 61. However, according to a modified plan, after equipping motorized brigades with 16 tankettes, remaining 8 TKS from the second batch were to be given to the 62nd Armoured Unit of Podolska (of Podole) Cavalry Brigade and the 91st Armoured Unit of Nowogrodzka (of Nowogrodek) Cavalry Brigade. Documents suggest, that their mother battalions (4th and 6th) indeed received cannon-armed tankettes in early August, but there is no proof so far, that these two units had them in September 1939[note 3]. On the other hand, there is a strong hint, that cannon-armed TKS were used by the 51st Armoured Unit of Krakowska (Cracov) Cavalry Brigade (TK-equipped), since such vehicle was identified on a photo on the unit's combat track (see further). There are no documents nor reports, but it is probable, because its mother 5th Armoured Battalion was ordered to send four TK-3 for rearmament by 28 August. Some suggest, that some tankettes could have been used in Independent Reconnaissance Tank Companies - K. Gaj suggested, that 4 cannon-armed TKS were in the 71st Independent Reconnaissance Tank Company and 3 cannon-armed TK-3(!) in the 81st Independent Reconnaissance Tank Company, but this information was rather based on plans. An unidentified abandoned cannon-armed TKS. A purpose of a dark rectangle next to a driver's visor is not clear. 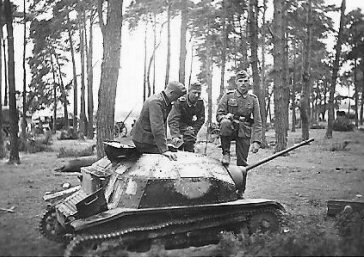 TKS tankettes after a battle of Tomaszów Lubelski, first on the right is cannon-armed. 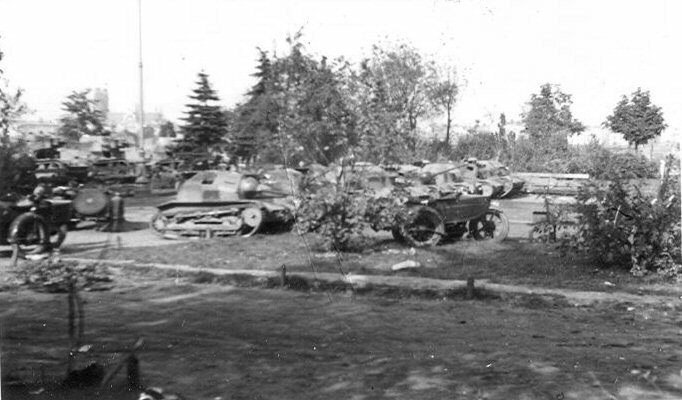 Vehicles gathered after a fall of Warsaw - visible are at least two cannon-armed TKS (the one on a photo in the beginning of a chapter is the 4th from right). The cannon-armed tankettes were actively used during the German invasion in September 1939, but there is no specific information concerning most of them. Only actions of the first platoon of the 71st Armoured Unit of the Wielkopolska Cavalry Brigade (Poznań Army), fighting in western and central Poland, are relatively well known – although there are discrepancies when it comes to details. Unfortunately, a course of its combats has not been researched by historians in detail, and is known only from partial publications basing on personal accounts. During first two weeks the unit apparently had no encounters with enemy armour, although it was in action since 1 September. On 9 September the unit acquired another cannon-armed TKS, found in a railway transport at Jackowice station (probably belonging to the 81st Unit). 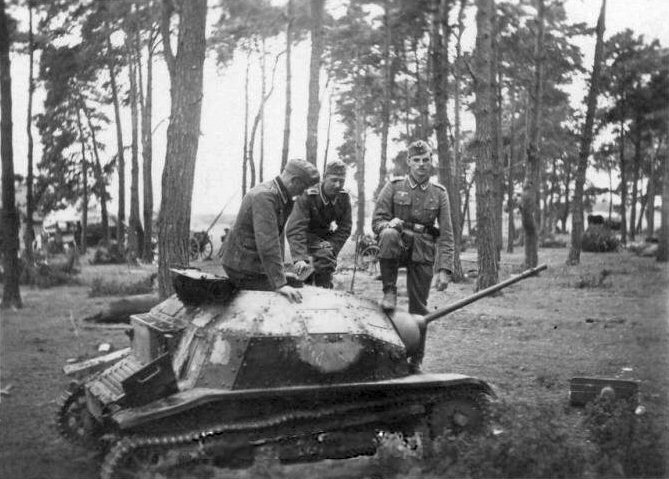 On 14 September 1939 the 71st Unit's tankettes were supporting an attack of the 7th Mounted Rifle Regiment on BrochówW (on the Bzura river, east of Warsaw), during a battle of the BzuraW. Its cannon-armed tankettes immobilized at least three German tanks of the 4th Panzer Division, firing across the river, helping the Poles to capture the village. There are, however, conflicting versions on how many Polish tankettes participated, and who fired at German tanks[note 4a]. The most famous action took place on 18 September near Pociecha in Kampinos ForestW (east of Warsaw), when Polish units were withdrawing towards Warsaw. A platoon of three cannon-armed tankettes of the 71st Unit, sent to fight enemy armour, encountered a patrol of three German tanks of the 11th Panzer Regiment of the 1st Leichte Division on a forest crossroad. The tankettes disabled all three tanks without losses (probably one PzKpfw-IVB and two PzKpfw-35(t)). The PzKpfw IVB was burned, and there was killed a platoon commander of the 2nd company, Leutnant prince Victor von Ratibor. There is a well-known popular myth, that all tanks were destroyed by the only cannon-armed tankette, manned by Cadet Corporal Edmund Roman Orlik, and the remaining tankettes were MG-armed. In fact, there is another, more credible account, supported by more evidence, that there were three cannon-armed tankettes, and a main role was played by Corporal Władysław Tritt, who was awarded for his actions post-war (Orlik might have participated in this action, though)[note 4b]. 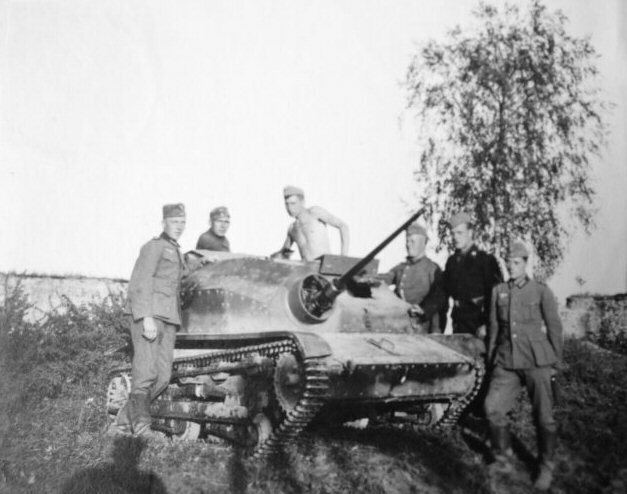 On the next day 19 September, remaining tankettes supported Polish cavalry defending Sieraków village in Kampinos Forest against tanks of the 1st Leichte Division. According to his account, Orlik carried out short raids from earth pits and back, to the left flank of advancing Germans, and claimed to have disabled seven tanks. 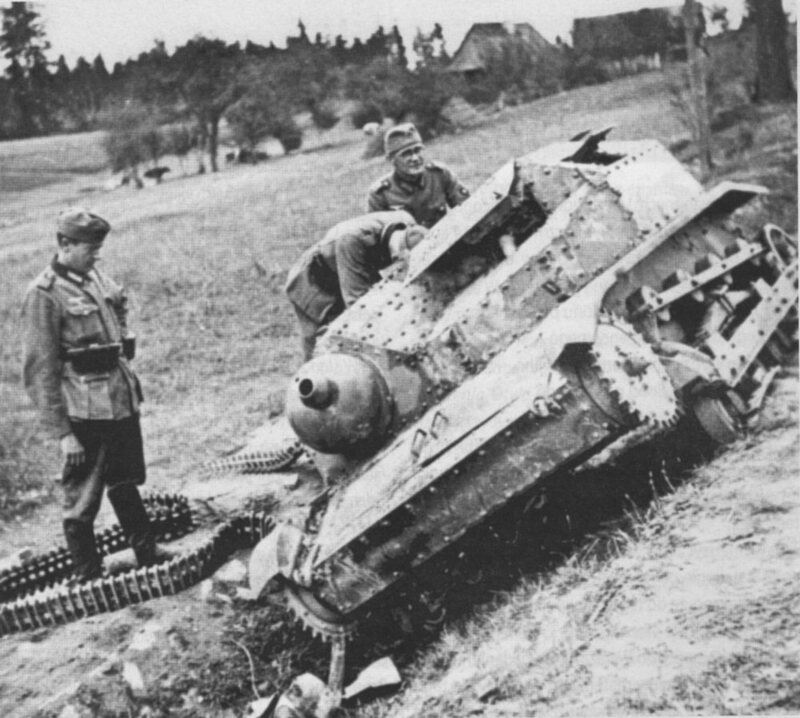 The Germans suffered substantial losses from the Polish defence (according to Polish reports, some 20 tanks), but exact number of tanks disabled by the cannon-armed tankettes is not confirmed[note 4]. In the battle there was killed Hauptmann von Kriegsheim, a company commander of the 65th Pz.Abt. 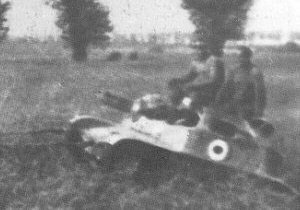 At least two surviving cannon-armed tankettes of the 71st Unit got through to Warsaw on 20 September or in following days and took part in its defence, this time without success. There are no details known about usage of cannon-armed tankettes of the 2nd platoon of the 71st Armoured Unit – or they could have acted together from some point. The tankettes of the 2nd platoon were destroyed around 18 September in Kampinos Forest because of lack of fuel, but it is not known, if any cannon-armed ones were among them. Last tankettes of the 1st platoon were kept in working order thanks to a fuel recovered from wrecked German vehicles at that time. It should be noted, that the 71st Armoured Unit fought from the first day of World War II, initially in area of LesznoW. 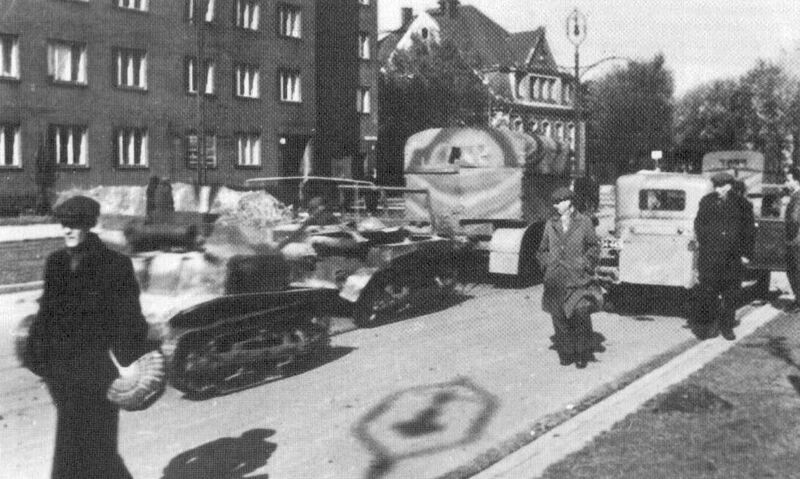 On 2 September 1939 it supported Polish troops in a short raid to the German territory, and its tankettes were fighting against Grenzwacht units in GeyersdorfW village. From 7 September the unit took part in a battle of the Bzura RiverW, in area around ŁęczycaW, ZdunyW and GłownoW. There is not much specific information on actions of cannon-armed tankettes in other units. Tankettes of the 10th Cavalry Brigade contributed to quite successful delay fights of the Brigade in the first days of the campaign in Beskid mountainsW in southern Poland, against elements of two armoured divisions (2 PzDiv and 4 LeDiv). The Brigade's tankettes entered combat just on 1 September near JordanówW, then in following days they fought among others near DobczyceW, TymbarkW, Nowy WiśniczW. 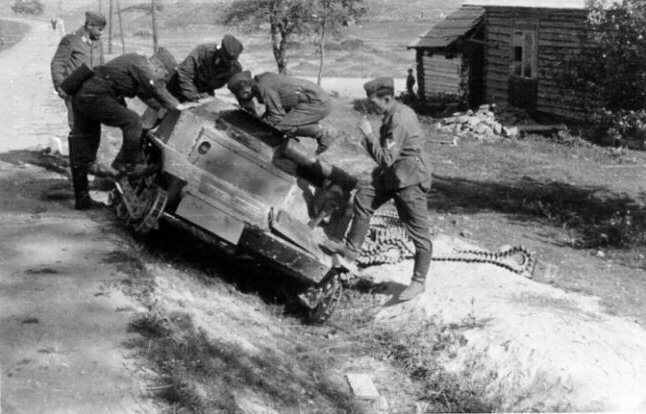 Cannon-armed tankettes were certainly responsible for some of armoured vehicles destroyed by the Polish troops, although there is a clear information only on one case, when tankettes of the 101th Company destroyed several tanks during a combat on 9 September near AlbigowaW, where the German advance was stopped. On 15-17 September the tankettes supported Polish attack on Zboiska near LvivW, not fighting against armour however. 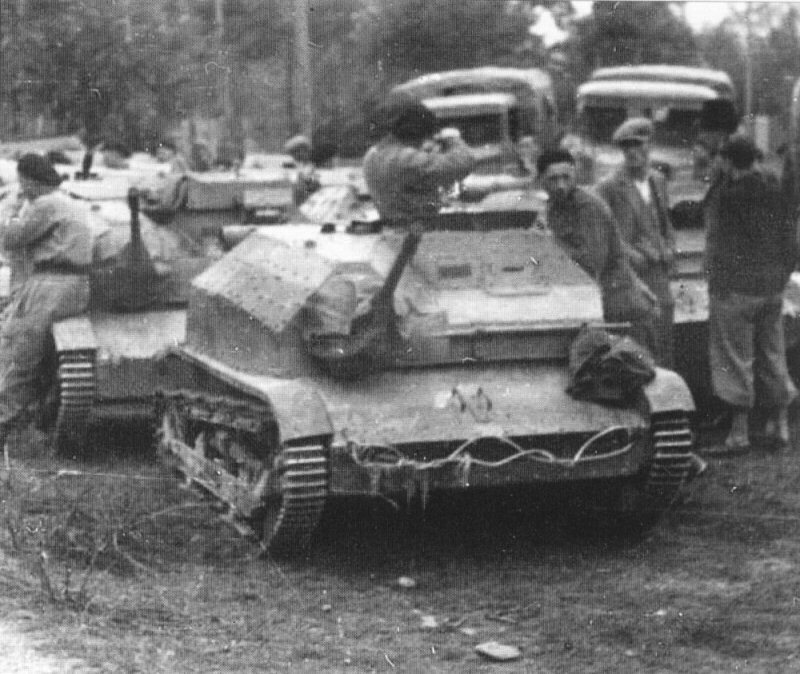 Four surviving tankettes with cannons were withdrawn to Hungary on 19 September along with the 10th Cavalry Brigade, where they were interned and then seized by the Hungarians. 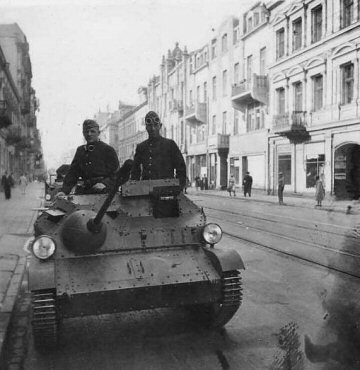 The Warsaw Armoured-Motorized Brigade fought in central and eastern Poland. Tankettes of its recce tank squadron suffered heavy losses of 6 (or 7) vehicles in combat near LipskoW on 10 September against German 15th Motorized Regiment, but it is not known whether cannon-armed ones participated in it. On 13 September tankettes of the Brigade's 11th Company took part in an unsuccessful attack on AnnopolW bridgehead. 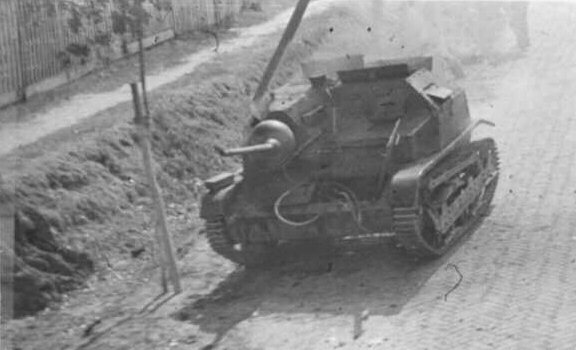 Cannon-armed tankettes positively took part in the Brigade's last three-day battle of Tomaszów LubelskiW 18-20 September 1939, in which Polish units did not manage to break through a German defence towards Lviv and all armoured vehicles were eventually lost (one tankette commander Stanisław Żak was commended to be awarded a Cross of ValorW). 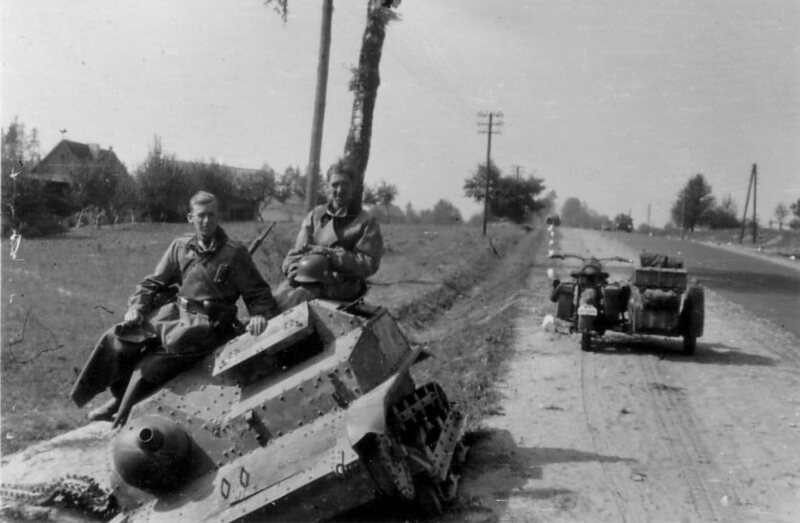 Tankettes of the 81st Armoured Unit fought in "Pomeranian corridor" in the north, among others near ChojniceW on 1 September, then in Polskie ŁąkiW and SwiecieW on 3 September, when it lost four tankettes. 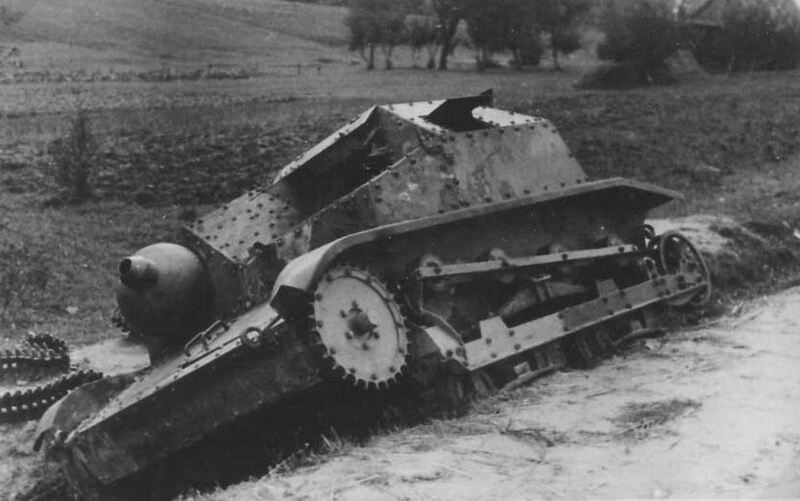 One broken down cannon-armed tankette was sent to the rear on 4 September with a seized engine, and probably it was next acquired and repaired by the 71st Armoured Unit. 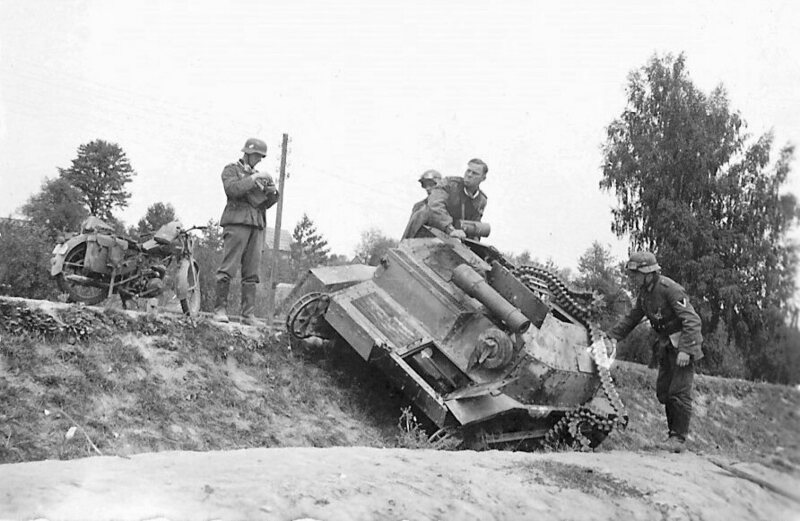 By 6 September, the Unit's vehicles, lacking a proper maintenance, were in a poor shape, and two last cannon-armed tankettes broke down (the fourth one was destroyed before or the unit had only three, it is not clear). The unit's remains with 6 tankettes were sent to the rear for a reorganization (via Kutno, Warsaw to LutskW). 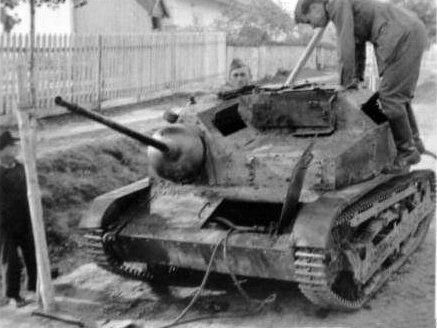 Probably it did not use its cannon-armed tankettes anymore in action (two last repaired TK-3s, MG-armed, fled with the unit to Hungary). A commander of a cannon-armed tankette, Cadet Adam Byrzykowski, was awarded with a Cross of Valor. There are known photographs of at least eleven cannon-armed TKS destroyed or abandoned in 1939, and four withdrawn to Hungary, what constitutes a majority of vehicles. Unfortunately, their identification is usually impossible. 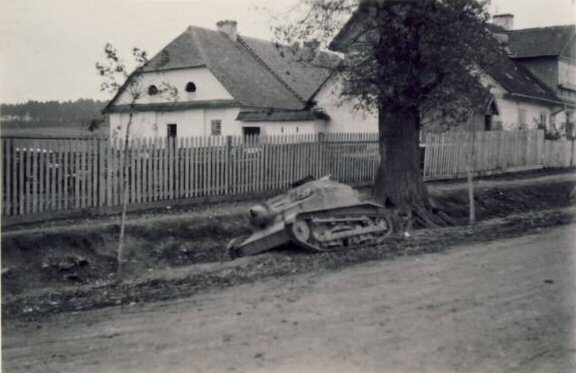 Most probably such tankettes were in the 51st Armoured Unit of Krakowska Cavalry Brigade, fighting in southern Poland, because a location of one widely photographed vehicle (see in a gallery below) was identified to be in GózdW village north of KielceW, where the 51st Unit fought and suffered some losses on 7th September. In addition, its gun mantlet was recovered in nearby farm, serving as a lamp cover (this information was published for the first time here in 2014, thanks to Odkrywca forum participants, and the place was finally identified in 2018 thanks to DWS forum). 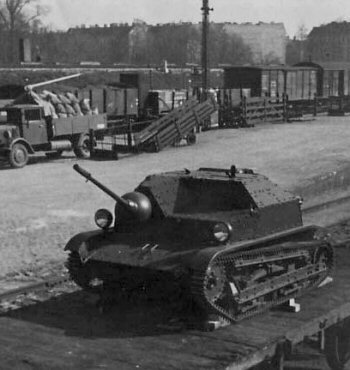 In a course of the campaign, tankettes with cannons were also used in the motorized-armoured group of Warsaw Defence HQ. They came near the end of the siege of Warsaw (on 20 September or later), and apparently had no chance to fight against armour. 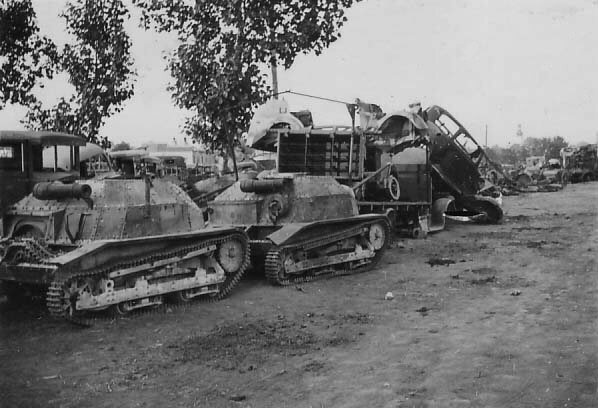 It was believed so far, that it had one such tankette (of Roman Orlik from the 71st Armoured Unit), but lately there was revealed a photo of surrendered equipment, showing two such tankettes (this information was published for the first time here, in 2014 update). 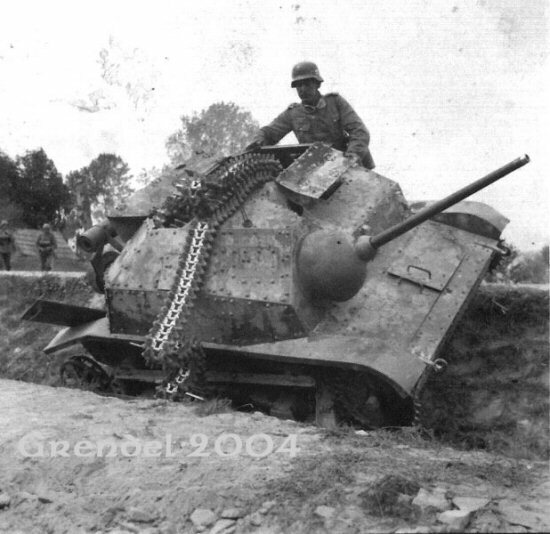 It confirms accounts, that the Orlik's tankette was not the last remaining from the 71st Armoured Unit. Apart from four cannon-armed tankettes of the 10th Cavalry Brigade withdrawn to Hungary, the rest were destroyed or abandoned due to damage or technical reasons during the campaign, and were seized by the Germans. 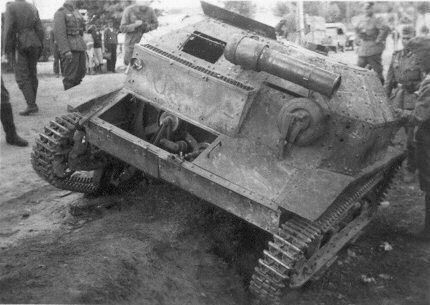 There exist several photos of at least one cannon-armed tankette with German modifications, notably uncovered headlights on fenders. Details of their German service are not known, although it apparently concerned no more, than a couple vehicles (Polish tankettes were generally used by the Germans to auxiliary and security duties only, where cannons were less useful). 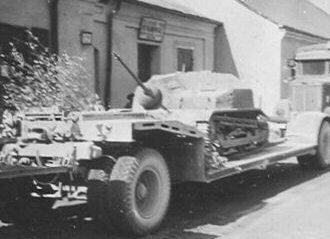 The Hungarians impressed seven TKS in total into service, but Hungarian sources don't mention cannons as tankettes' armament. The cannon-armed tankettes were the only ones able to fight enemy tanks in 1939. Combining a small size with agility and firepower, they were efficient tank destroyers, as for standards of a beginning of the war at least. Of course, they were treated as reconnaissance tanks, not special tank destroyers, but some analogy seems justified – especially, that tankette companies or squadrons were not only reconnaissance element, but in practice the only armoured support available for Polish troops. Their bullets could pierce an armour of almost all German and Soviet tanks of that time, including newest models of PzKpfw III and IV, in favourable conditions. Most tank combats took place on short distances due to terrain conditions, what played in a favour of 20 mm cannon. Besides, similar armament was carried by basic German tank PzKpfw II. Only after experiences of Polish campaign (also encounters with wz.35 anti-tank rifles), the Germans started to uparmour their basic tanks with additional applique plates. 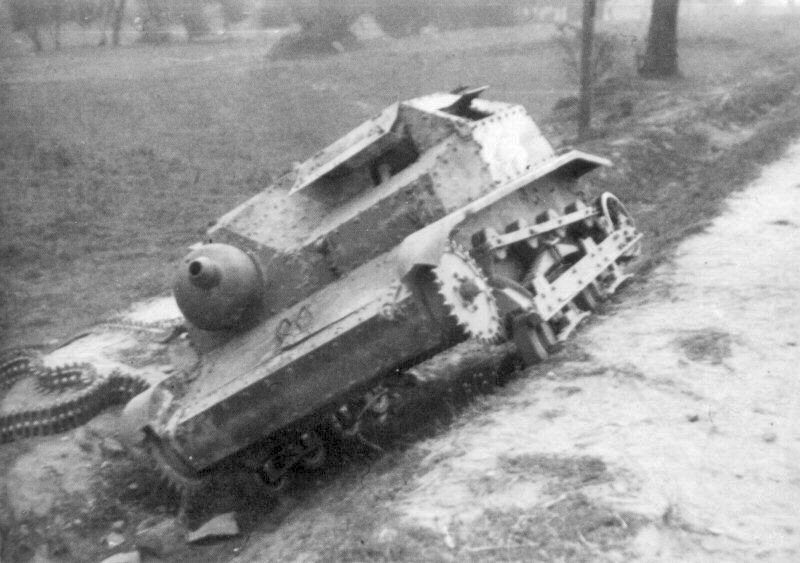 Combat value of tankettes was mostly limited by weak armour, vulnerable to all anti-tank weapons. There occurred some problems with ammunition supplies, though Orlik's account says about using captured German ammunition, and two other accounts suggest so indirectly (it is not clear, if they were interchangeable - Polish ammunition, despite generally modelled after "long" Solothurn ammunition 20x138 mm, used by the Germans, had longer 140 mm case, with small differences in diameter. Although it is probable, such possibility has not been confirmed positively so far). As combat experience showed, rearming of tankettes was the right step. If plans were realized, it would allow to double a number of armoured vehicles capable of fighting against tanks, for relatively low price. 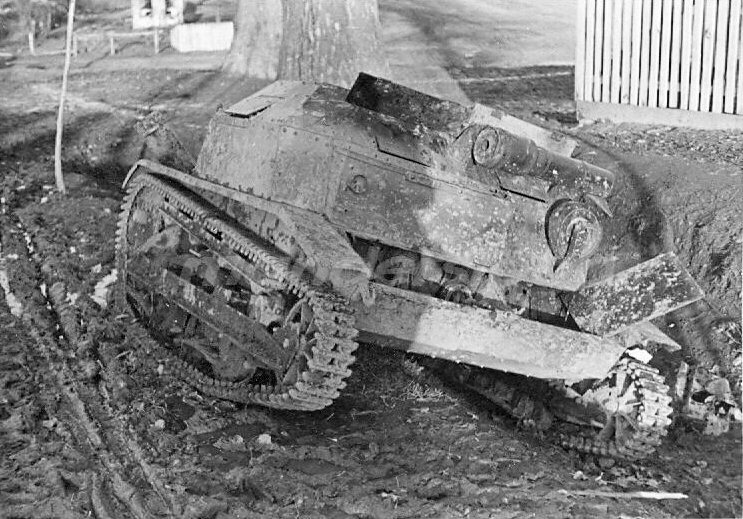 The rearment cost was above two-thirds of a tankette's original price, but it was still six times cheaper, than 7TP light tank, of which production capabilities were limited anyway. Unfortunately, in spite of early awareness of their value, the program started too late, what resulted in a small quantity of rearmed vehicles. On the other hand, thanks to undertaken efforts, a handful of cannon-armed TKS tankettes appeared just about time, in few weeks before the war. 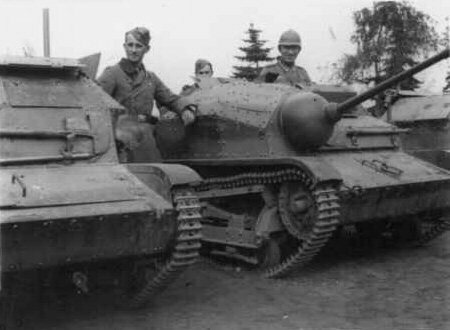 It is noteworthy, that Polish tankettes were the only such small vehicles able to fight tanks at that time - only the Italians mounted 20 mm Solothurn guns in their CV 33/35 tankettes, but it was only after 1940. 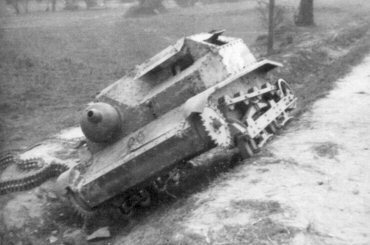 The other thing is, that only in Poland and Italy cheap turretless tankettes, of little overall value, became a basis of armoured forces... There should be mentioned a Czechoslovak export vehicle Skoda S-Id, armed with 37 mm gun, and French Renault AMR-35 ZT-3 with 25 mm gun, but they were bigger and were in fact self-propelled guns. Up and below: a series of photos of an abandoned trackless TKS with a cannon, in a village identified as Gózd, north of Kielce, on a road towards Skarżysko-Kamienna, what suggests the 51st Armoured Unit (satellite photo, street view - on right side of the road). Upper left photo - from a collection of Krzysztof Kuryłowicz. Below: a cannon-armed TKS in Tarnawatka, on a road from Tomaszów Lubelski towards Zamosc (we have identified a place on a map, and street view - on right side of the road). The tankette probably belonged to the WBP-M brigade, although there are some doubts[note 3]. On the first photo the vehicle seems to be still burning. Later its gun was removed and it was pushed aside. Left: a cannon-armed TKS transported by the Germans after its capture on Sd.Ah. 115 trailer. 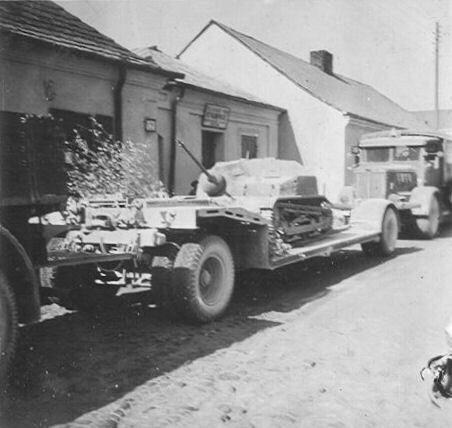 Right: a cannon-armed TKS, hauled by C4P halftrack tractor after a surrender of Warsaw (along with C2P tractor) - the same, as the first one under section "Combat use". 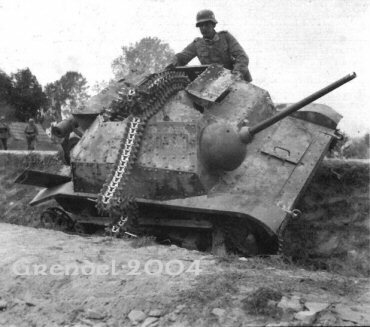 Up and below: canon-armed tankette(s?) in German service, with German headlights on fenders. They seem to be overpainted in uniform Panzergrau grey color. Peculiar is a lack of nationality markings, otherwise seen on captured tankettes (possibly they were used by some security formation). 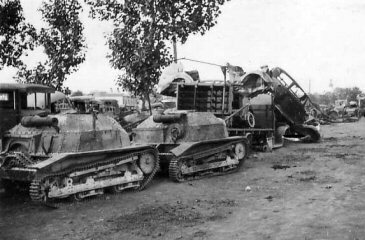 On a left upper photo, there are tankette trailers in a background visible, although they seem to be of French origin. See also profiles of TKS with 20 mm cannon by P. Sembrat from . 1. There are doubts in some publications, if the 10th Cavalry Brigade received its all eight cannon tankettes, or only four, owing to a lack of documents on its actual combat complement. 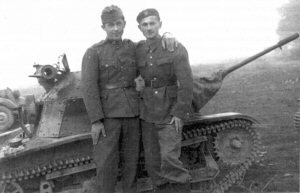 Most notably, Marian Żebrowski  wrote, that the 101st Reconnaissance Tank Company and reconnaissance unit of the 10th Cavalry Brigade had only two cannon-armed tankettes each (see note 2 below about this source). It is known, that the 2nd Armoured Battalion received 8 tankettes before the war with clear orders to give them to the 10th Cavalry Brigade during a mobilization, although the orders assumed, that four would go to the reconaissance unit and four to tankette platoons in motorized regiments, which were not created eventually. It may be assumed, that last four were finally given to the Brigade's 101th Reconaissance Tank Company, also mobilized by the 2nd Battalion (which did not mobilize any other tankette units). 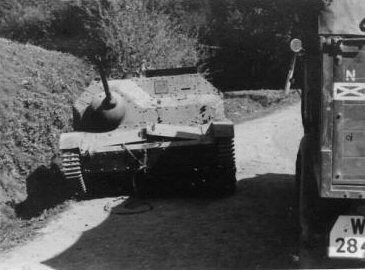 The fact, that four tankettes with cannons were evacuated to Hungary, may suggest, that it was their number, but on the other hand, it may be a hint, that there were initially more of them, considering a margin for inevitable combat or technical losses. 2. Marian Żebrowski in "Zarys historii polskiej broni pancernej" from 1971  wrote, that the 81st Armoured Unit received only three TKS with cannons, in return for three TK-3 sent for rearmament. It should be kept in mind, that it is not a definite source, an it was written outside of Poland, basing on partial reports and accounts - however actions of the 81st Unit are described rather in detail there. This issue is not clear, especially, that J. Ledwoch claims, that several accounts confirm three tanketts in the 81th Unit. According to orders, its mother 8th Battalion should receive all 4 tankettes from the WBPM just before the war, and give them to the 81th Unit. 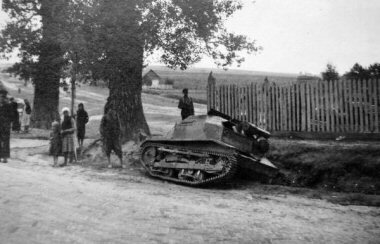 It can not be excluded, that the tankette taken over by the 71st Unit on Jackowice station on 9 September was the fourth one, sent for the 81st unit, not a broken down one sent by the 81st Unit. 3. There was a mysterious cannon-armed TKS destroyed in Tarnawatka (north of Tomaszów Lubelski), heading north on a road towards Zamosc (map), pictured in the gallery above. 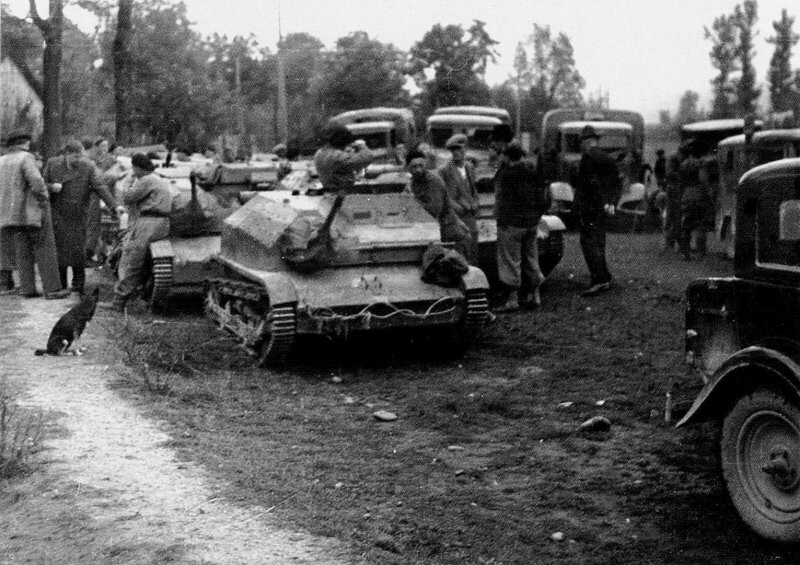 There was a battle of Tomaszów LubelskiW fought by Warsaw Armoured-Motorized Brigade, but Polish units attacked from north-west of Tomaszów and tried to break towards south... It theoretically might belong to the 91st Armoured Unit or 61st Armoured Unit (the latter is not mentioned among units, that were to be rearmed first). Both units operated north of Tomaszów Lubelski, but there is no information in books on fighting specifically in Tarnawatka and their losses there. 4a. According to a series of three articles written by Janusz Magnuski in 1977-79, and repeated in 1995 book "Karaluchy przeciw panzerom" (Cockroaches vs panzers), Cadet Master Corporal (plutonowyW podchorąży) of the reserve Edmund Roman Orlik reportedly commanded the sole cannon-armed tankette during skirmishes at Brochów (14 September), Pociecha (18 September), Sieraków (19 September) and Warsaw defence. He claimed to have disabled three tanks at Brochów, three at Pociecha (acting on personal direct order of the brigade commander Gen. AbrahamW) and seven at Sieraków. He claimed also, that he used ammunition taken from German vehicles, and that his tankete was the only vehicle of the 71st Armoured Unit to get through to Warsaw. Unfortunately, his accounts were not published in original form, but became a basis for Magnuski's dramatized narration on skirmishes at Pociecha and Sieraków, while Brochów and Warsaw defence were only mentioned. However, in 1979 there was published a letter by Corporal Roman Nawrocki, in which he claimed, that he had commanded a cannon-armed tankette at Brochów (immobilizing two tanks and firing at the third one), while Orlik had commanded MG-armed tankette there, in a three-tankette half-platoon. Orlik himself did not reveal any details to Magnuski on other tankettes' crews or armament. Nawrocki adds, that the tankettes wanted to drive closer to take bailed-out German crew as prisoners, but his canon-armed TKS ran out of ammo, and the Germans manned their tank again. He admitted, that he had no knowledge on Orlik's later actions, because he was assigned to artillery column then. Next, they both drove their tankettes to Warsaw (Nawrocki did not write, what was an armament of Orlik's tankette at that time). 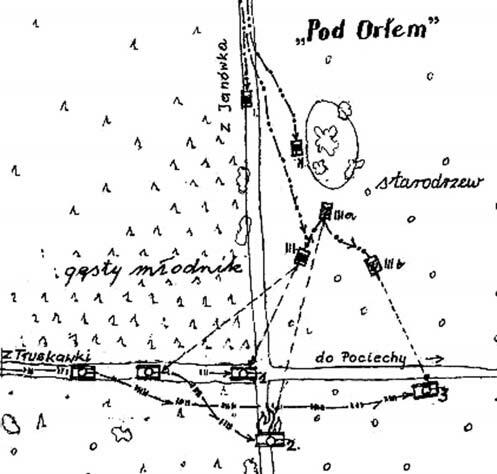 Both versions are, therefore, contradictory as for the combat at Brochów, and Nawrocki's account looks more probable here – especially, that it came in answer to articles by Magnuski, who had only mentioned about this combat. Still, more confusion was caused by quite detailed account by Master Corporal (plutonowy) Władysław Tritt, written down in 1968 for an award application (which we have obtained thanks to his son Lech - revealed for the first time on our page in 2018). According to him, at Brochów the platoon numbered two cannon-armed and six MG-armed tankettes(!). 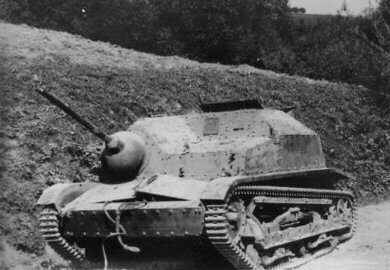 While covering tankettes fording the Bzura river, Tritt disabled three tanks and repelled others, firing across the river with his cannon-armed TKS. 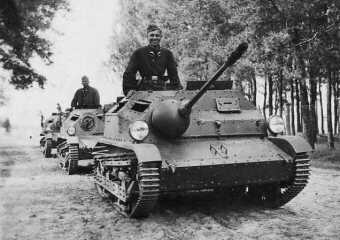 By extension, this account leaves a place for the second cannon-armed tankette, manned rather by Nawrocki, than Orlik (unfortunately, Tritt did not write any names). It is possible, that both accounts concern different parts of the combat, especially, that Nawrocki did not mention firing across the river, and tried to take prisoners (on the same bank?) – or both tankettes might have fired at the same targets. 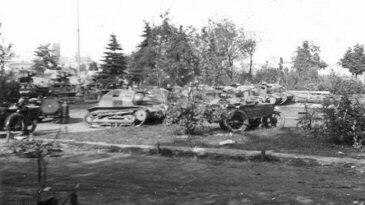 Also another soldier of the 71st Unit Corporal Kazimierz Nowakowski wrote in plural, that "our vehicles with cannons" disabled three tanks in that skirmish (his account is only partially known to us, but there are no more details). It should be noted, that W. Tritt was awarded in 1972 with Virtuti Militari 5th class order, among others for participating in the skirmish near Brochów and disabling of "several" tanks. A sketch of a skirmish at Pociecha 18 September 1939 drawn by Edmund R. Orlik. 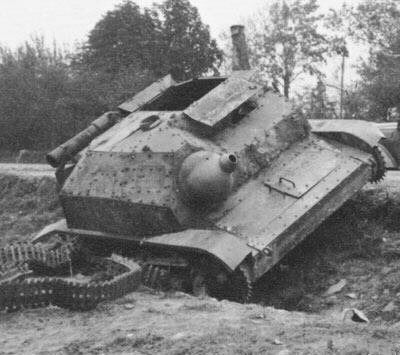 Wreck of PzKpfw IVB, regarded to be the tank destroyed at Pociecha. It must be found peculiar, that M. Żebrowski in his "Zarys historii polskiej broni pancernej" (History outline of Polish armoured weapons), written in London in 1971, basing upon partial documents, reports and accounts of Polish soldiers in exile, does not mention Orlik's name at all in a chapter describing the 71st Armoured Unit. Maybe it was connected with a fact, that Orlik, as well as also unmentioned Nawrocki, were NCO of the reserve, less known to pre-war cadre? Nevertheless, it seems, that the tanker, who destroyed thirteen tanks alone (all known victories of this unit in fact), should have been a sensation, and be well-known in the unit. 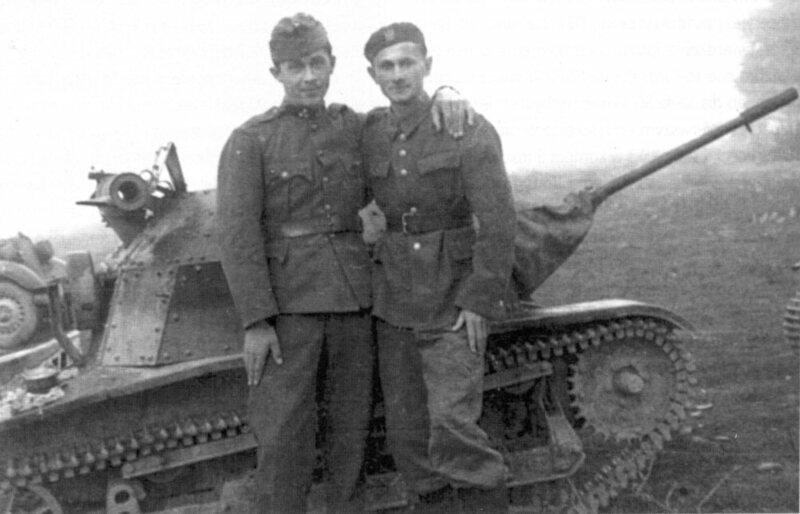 According to Żebrowski, at Pociecha there fought the 1nd platoon commanded by Lt. Bronisław Kalinowski (at that time he was already the tankette squadron commander, previously the 1st platoon's commander), and there participated: Cpl. Tritt, Cpl. Pachocki and Cpl. Łopatka... It might be noted, that already on 28 September the latter two were awarded with the Cross of ValourW for their actions in the campaign (without detailed reasons known, although Pachocki had been wounded during the campaign). What's more, long before Orlik, already in 1964, Master Corporal (plutonowy) Władysław Tritt had described a skirmish at Pociecha in a letter to Polish authorities, then in 1966 in a letter to one newspaper, and in 1968 award aplication. He claimed constantly, that there were three cannon-armed tankettes present at Pociecha, and he disabled two tanks personally, while the third was destroyed together. According to him, German captives shouted, that "their general" remained in a burning tank, what he associated later with a death of General Werner von Fritsch. The "General story" is apparently incredible, but it is similar to description of Germans telling, that "their captain" remained in the tank according to Orlik. It is significant, that in 1972 Władysław Tritt was awarded with the highest Polish military order of Virtuti Militari 5th classW, and an application, in which he described skirmishes at Brochów and Pociecha, was signed by the tankette squadron commander of the 71st Unit B. Kalinowski and the deputy commander of the 71st Unit Kazimierz Rose, and approved by Gen. Abraham - the commander of Wielkopolska Cavalry Brigade. Therefore, this version may be regarded as officially established (it was described on our page in 2018, for the first time to wider public, thanks to help of Wladysław's son Lech Tritt). Cpl. Tritt described, that he got to firing position first, taking cover behind a big anthill, and hit two tanks. The cavalrymen also pulled an anti-tank gun then, but the third tank overthrew it. Then, the third tank was disabled by all tankettes together. There is no information, if among Polish tankists was Orlik (Tritt only mentioned, that Pachocki had taken part and been hurt by a splinter - although Roman Nawrocki (see note 4a) claimed, that he got the cannon-armed tankette after Pachocki had been wounded around 10 September - maybe he was hurt twice?). Also R. Szubański in some of his books wrote about three tankettes with cannons (it is not known, on what sources he based). There are also other versions of the skirmish met in publications. Gen. Abraham wrote in memoiries, that a cavalryman Adam Furman destroyed the tank with his AT-gun (37 mm Bofors wz.36), and the other two were destroyed by TKS tankettes and anti-tank rifles wz.35. The general was not an eyewitness, though. To sum up, there seems to be no doubt, that three tankettes with cannons took part in a skirmish at Pociecha, not only Orlik's one. One tankette was commanded by Władysław Tritt, the second probably by Mieczysław Pachocki, and the third might have been commanded by Orlik. There also participated Kazimierz Nowakowski and Stanisław Łopatka, but their functions are not known. It is difficult to estimate a contribution in disabling three tanks, especially, that not all hits of 20 mm bullets were dangerous. The popular version, that Orlik got a personal order from Gen. Abraham and destroyed the three tanks with a sole cannon-armed tankette, is therefore, a myth, unfair for other Polish tankers. A sketch drawn by Orlik indicates, that its author probably took part in the skirmish, despite a misrepresentation of other tankettes' role, and some discrepancies with Tritt's accounts. It should be noted, that Orlik told his version to Magnuski more than ten years after Tritt's public letters, almost forty years after the events, and after Gen. Abraham's death (in 1976). There is another possibility, that Orlik could have "modified" his memories, in order to conform with what Roman Okuszko had remembered from Orlik's wartime stories (heard in 1939 in Warsaw! ), and had told Magnuski... It seems, that a distortion of a story heard from a friend almost forty years before is more than probable. Magnuski might have not wanted to change details given in his first article much as well. Finally, it should be noted, that Orlik was purportedly awarded with Virtuti Militari 5th class order in 1979, but it was ilegally invested by self-proclaimed "president of free Poland in exile" Juliusz Nowina-SokolnickiW, apparently after Magnuski's articles. 4c. It may be surprising, that nobody except Orlik claims to take part in a battle off Sieraków on 19 September. German tanks of the 1st Leichte Division suffered high losses there against defence of Polish uhlans, supported by mounted artillery and AT guns. However, one cavalryman, quoted by Magnuski, confirmed, that Gen. Abraham had thrown tankettes to fight. All in all, a number of 7 tanks immobilized by a single tankette is most probably overestimated, considering well-known tendence to overestimate enemy losses - especially in a view of limited credibility of Orlik (see notes 4a and 4b above). 2. Leszek Komuda, "Przeciwpancerne tankietki" in: "Militaria" Year 1 Nr. 3 and Nr. 4. Leszek Komuda, Norbert Baczyk, "Niszczyciel czołgów po polsku" in: "Nowa Technika Wojskowa" special issue 6 (3/2009). 6. Mirosław Zientarzewski, "Przeciwpancerne tekaesy" in: "Militaria i Fakty" 2/2006. Photo source not indicated - mostly assorted photographs taken by German soldiers, or Polish official pre-war photographs. Corrections and comments are welcome. All photos and pictures remain the property of their owners. They are published in non-commercial educational and research purpose. Text copyright to Michał Derela © 2007-2014.